Rice University says many undergraduate students from families with incomes up to $200,000 "will no longer be required to take out loans." 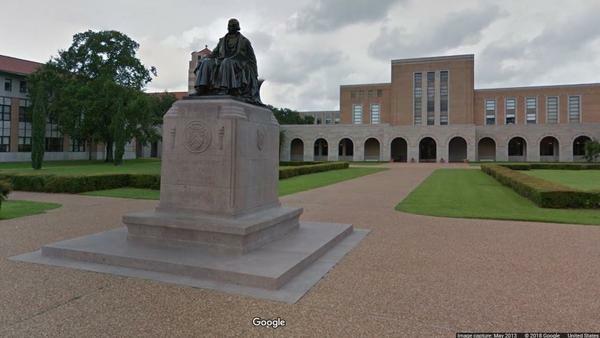 Here, a statue of the school's founder, William Marsh Rice, is seen on its campus in Houston. The full scholarships are earmarked for students whose families have incomes between $65,000 and $130,000. Below that level, the university will not only cover tuition but also provide grants to cover students' room and board, along with any other fees. Another part of the program will help students whose family income surpasses the maximum: If their family's income is between $130,000 and $200,000, they can still get grants covering at least half of their tuition. The change reconnects Rice to a key part of its legacy, Leebron said. For decades after the school first opened in Houston in 1912, Rice didn't charge tuition at all. It changed that policy in 1965. The financial aid will be offered under a plan called the Rice Investment — which the school says is aimed at cutting the burdens of student debt. Under the new system, students who qualify "will no longer be required to take out loans as part of their need-based financial aid packages," the school said. The new program will take effect in the fall of 2019. At that point, all of the school's undergraduate students will be able to seek the enhanced aid packages. About 4,000 undergraduate students enrolled at Rice University in fall 2017, the school's Office of the Registrar says. In response, Rice said it used the endowment to cover around 40 percent of its operating costs. Officials also said the fund "covers more than 90 percent of their financial aid program," as Houston Chronicle reporter Benjamin Wermund told Houston Public Media. Since then, the school's endowment has continued to thrive — and Leebron cited the fund's strong returns as one reason it is now able to make Rice more affordable to lower-income and middle-class families. While Rice plans to phase out many loans under the plan, it adds, "Students will still be expected to contribute toward the cost of attendance through moderate earnings from summer and academic year jobs."